U.S. President Donald Trump is flanked by U.S. Secretary of State Mike Pompeo, right, as he speaks during a press conference after a summit of heads of state and government at NATO headquarters in Brussels, Belgium, Thursday, July 12, 2018. 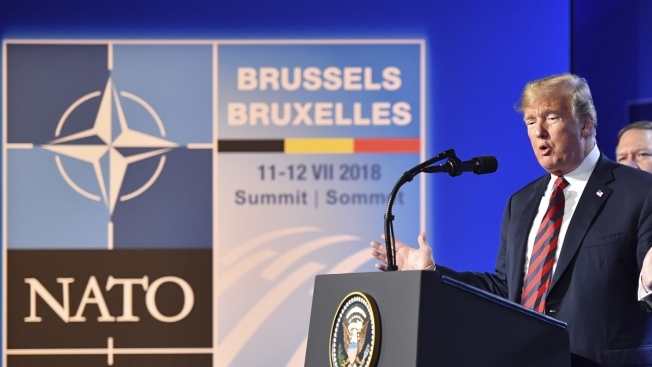 Montenegro, a U.S. ally that is smaller than Connecticut and about as populous as Baltimore, found itself in President Donald Trump's cross hairs late Tuesday as he once again criticized NATO, NBC News reported. The president suggested during an interview with Fox News' Tucker Carlson that he would be unhappy defending "tiny" Montenegro if it were attacked, calling into question NATO's central principle of mutual defense. Trump also questioned whether the country's "very aggressive people" could draw NATO into a war with Russia. Carlson had asked why his son would have to defend Montenegro should it be attacked. Trump replied that was a good question and said that Montenegro "may get aggressive, and congratulations you're in World War III." Trump's comments come as 14 people are standing trial in Montenegro, accused of plotting to kill the prime minister and stage a coup to bring a pro-Russian party to power.